In type 1 diabetes, the pancreas does not produce insulin. Insulin is a hormone that is involved in regulating blood sugar (glucose) by controlling how much glucose you make between meals and how you store glucose that you absorb after a meal. It is important to quickly treat hypoglycemia and raise blood sugar levels by eating sugar, sucking on hard candy, drinking fruit juice, or injecting the hormone glucagon. Patients who are at risk for hypoglycemia should carry some sugar product, or an emergency glucagon injection kit, in case hypoglycemia occurs. Patients should also wear a medical alert ID bracelet or necklace that states they have diabetes and take insulin. Technology is moving forward in combining a device that adjusts the dose of insulin (and often a doses of a second hormone called glucagon) in response to continuous glucose monitoring. Due to both expense as well as need to further refine the technology, this type of the device is mostly still being used in research studies. The 2 major forms of diabetes are type 1 (previously called insulin-dependent diabetes mellitus (IDDM), or juvenile-onset diabetes) and type 2 (previously called non-insulin-dependent diabetes mellitus (NIDDM), or adult-onset diabetes). Both type 1 and type 2 diabetes share one central feature: elevated blood sugar (glucose) levels due to not having enough of a signal from insulin, a hormone produced by the pancreas. In type 1 diabetes the reason the insulin signal is insufficient is because the amount of insulin in the blood is too low. Insulin is a key regulator of the body's metabolism. During and immediately after a meal, digestion breaks carbohydrates down into sugar molecules (of which glucose is one), and proteins into amino acids. The rise in blood glucose levels signals important cells in the pancreas, called beta cells, to secrete insulin, which pours into the bloodstream. Within 20 minutes after a meal insulin rises to its peak level. About 2 to 4 hours after a meal both blood glucose and insulin are back at low levels. The blood glucose levels are then referred to as pre-prandial blood glucose concentrations. 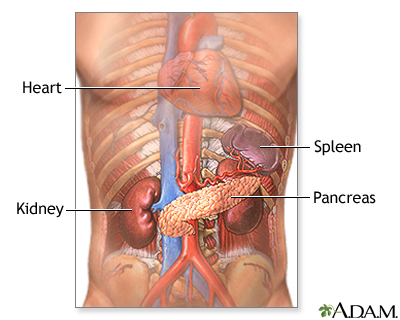 The pancreas is located below and behind the stomach. In addition to secreting digestive enzymes, the pancreas secretes the hormones insulin and glucagon into the bloodstream. The release of insulin into the blood lowers the level of blood glucose (simple sugars from food) by enhancing glucose to enter the body cells, where it is metabolized. 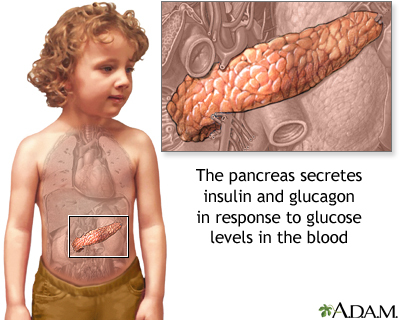 If blood glucose levels get too low, the pancreas secretes glucagon to stimulate the release of glucose from the liver. Type 1 diabetes is considered a progressive autoimmune disease, in which the beta cells that produce insulin are slowly destroyed by the body's own immune system. It is unknown what first starts this process. Evidence suggests that both a genetic predisposition and environmental factors, such as a viral infection, are involved. Among the viruses under scrutiny are enteric viruses, which attack the intestinal tract. Coxsackie viruses are a family of enteric viruses of particular interest. Epidemics of Coxsackie virus, as well as mumps and congenital rubella, have been associated with type 1 diabetes. Diabetes increases the risk for many serious health complications. The good news is that during the past several decades, the rate of serious complications among people with diabetes has been decreasing, and more patients are living longer and healthier lives. Diabetic ketoacidosis (DKA) is a life-threatening complication caused by a complete (or almost complete) lack of insulin. In DKA, the body produces abnormally high levels of blood acids called ketones. Ketones are byproducts of fat breakdown that build up in the blood and appear in the urine. They are produced when the body starts burning much larger amounts of fat than the body needs for energy. The buildup of ketones in the body is called ketoacidosis. Extreme stages of diabetic ketoacidosis can lead to coma and death. For some people, DKA may be the first sign that someone has type 1 diabetes. In type 1 diabetes, it usually occurs when a patient is not taking insulin as prescribed, runs out of insulin, or cannot afford to buy medication. Sometimes patients intentionally reduce insulin doses in order to lose weight. DKA can also be triggered by a severe illness or infection that weakens the immune system and stresses the body. Life-saving treatment uses rapid replacement of fluids with a salt (saline) solution followed by low-dose insulin and potassium replacement. Hyperglycemic hyperosmolar syndrome (HHS) is a serious complication of diabetes that involves a cycle of increasing blood sugar levels and dehydration, usually without increasing blood ketones. HHS usually occurs with type 2 diabetes. But it can also occur with type 1 diabetes. It is often triggered by a serious infection or another severe illness, or by medications that lower glucose tolerance or increase fluid loss (especially in people who are not drinking enough fluids). Tight blood sugar (glucose) control increases the risk of low blood sugar (hypoglycemia). Hypoglycemia occurs if blood glucose levels fall below normal. It is generally defined as a blood sugar below 70 mg/dL, although this level may not necessarily cause symptoms in all patients. Insufficient intake of food and excess exercise or alcohol intake may cause hypoglycemia. Usually the condition is manageable. Hypoglycemia can sometimes be severe or even life threatening, particularly if the patient fails to recognize the symptoms, especially while continuing to take insulin or other hypoglycemic drugs. Beta-blocking medications, which are often prescribed for high blood pressure and heart disease, can mask symptoms of hypoglycemia. Hypoglycemia unawareness is a condition in which people become accustomed to hypoglycemic symptoms. They may no longer have any signs of hypoglycemia until the hypoglycemia becomes severe. It affects about 25% of patients who use insulin, nearly always people with type 1 diabetes. In such cases, hypoglycemia appears suddenly, without warning, and can escalate to a severe level. Previous hypoglycemia is the biggest risk factor for hypoglycemic unawareness. Even a single recent episode of hypoglycemia may make it more difficult to detect the next episode. With vigilant monitoring and by rigorously avoiding low blood glucose levels, patients can often regain the ability to sense hypoglycemia symptoms. However, sometimes continuous glucose monitoring (CGM) is necessary to identify time periods when patients are hypoglycemic. CGM studies have shown that many people with type 1 diabetes are sometimes unaware that their blood sugars are very low. Diabetic nephropathy is the leading cause of end-stage renal disease (ESRD). Patients with ESRD have 13 times the risk of death compared to other patients with type 1 diabetes. If the kidneys fail, dialysis or transplantation is required. Symptoms of kidney failure may include swelling in the feet and ankles, itching, fatigue, and pale skin color. The outlook of end-stage renal disease has greatly improved during the last four decades for patients with type 1 diabetes, and fewer people with type 1 diabetes are developing ESRD. Autonomic. Affects nerves that help regulate digestive, bowel, bladder, heart, and sexual function). Autonomic dysfunction also affects sweat glands and can cause very sweaty or dry feet. Diabetic gastroparesis is a type of neuropathy that affects the digestive track. It is triggered by high blood sugar, which over time can damage the vagus nerve. The result of this damage is that the digestive system takes too long to move and digest food. Undigested food and the delay in stomach emptying can cause blood glucose levels to rise unpredictably, and make diabetes more difficult to control. Symptoms of gastroparesis include heartburn, nausea, abdominal bloating, feeling full after eating only a small amount of food, and vomiting of undigested food several hours after a meal. Gastroparesis generally only occurs in people who already have severe peripheral neuropathy. Patients with poorly-controlled blood sugars often have symptoms of gastroparesis, but this is reversible over weeks to months if blood glucose control improves. About 15% of patients with diabetes have serious foot problems. They are the leading cause of hospitalizations for these patients. The consequences of both poor circulation and peripheral neuropathy make this a common and serious problem for all patients with diabetes. Diabetes is responsible for more than half of all lower limb amputations performed in the U.S. Most amputations start with foot ulcers. People with diabetes who are overweight, smokers, and have a long history of diabetes tend to be at most risk. People who have the disease for more than 20 years and are taking insulin are at the highest risk. Related conditions that put people at risk include peripheral neuropathy, peripheral artery disease, foot deformities, and a history of ulcers. Foot ulcers usually develop from minor injury that goes unnoticed because of neuropathy. Infections can sometimes make the ulcer worse and can involve muscle and bone. About one-third of foot ulcers occur on the big toe. Patients with diabetes and neuropathy should check their feet every night before going to bed to look for redness, blisters, or ulcers. Charcot foot typically develops in people who have neuropathy to the extent that they cannot feel sensation in the foot and are not aware of an existing injury. Instead of resting an injured foot or seeking medical help, the patient often continues normal activity, causing further damage. Diabetes accounts for thousands of new cases of blindness annually and is the leading cause of new cases of blindness in adults ages 20 to 74. The most common eye disorder in diabetes is retinopathy. People with diabetes are also at higher risk for developing cataracts and certain types of glaucoma. The early and more common type of this disorder is called nonproliferative or background retinopathy. The blood vessels in the retina are abnormally weakened. They rupture and leak, and waxy areas may form in the retina. If these processes affect the central portion of the retina, swelling may occur, causing reduced or blurred vision. Patients with diabetes are at increased risk for contracting the hepatitis B virus, which is transmitted through blood and other bodily fluids. Exposure to the virus can occur through sharing finger-stick devices or blood glucose monitors. Adults newly diagnosed with type 1 or type 2 diabetes should get hepatitis B vaccinations. Type 1 diabetes is associated with slightly reduced bone density, putting patients at risk for osteoporosis and possibly fractures. Up to a third of young women with type 1 diabetes have eating disorders and under-use insulin to lose weight. Anorexia and bulimia pose significant health risks in any young person. But they can be especially dangerous for people with diabetes. The fasting plasma glucose (FPG) test is the standard test for diagnosing diabetes. It is a simple blood test taken after 8 hours of fasting. Pre-Diabetes (a risk factor for type 2 diabetes). Between 100 to 125 mg/dL. The FPG test is not always reliable, so a repeat test is recommended if the initial test suggests the presence of diabetes, or if the tests are normal in people who have symptoms or risk factors for diabetes. Widespread screening of patients to identify those at higher risk for diabetes type 1 is not recommended. Pre-Diabetes. Between 140 to 199 mg/dL. Patients who have the FPG and OGTT tests must not eat for at least 8 hours prior to the test. Any random blood glucose of 200 mg/dL or higher is also diagnostic of diabetes. 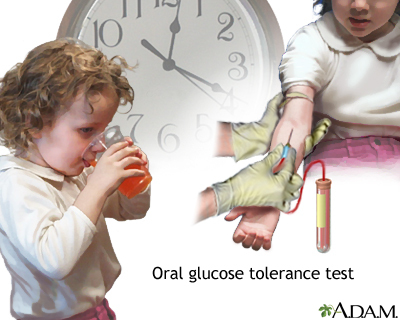 The oral glucose tolerance test is used to diagnose diabetes. The first portion of the test involves drinking a special glucose solution. Blood is then taken several hours later to test for the level of glucose in the blood. Patients with diabetes will have higher than normal levels of glucose in their blood. This test examines blood levels of glycated hemoglobin, also known as hemoglobin A1c (HbA1c). The results are given in percentages and indicate a person's average blood glucose levels over the past 2 to 3 months. (The FPG and OGTT show a person's glucose level for only the time of the test.) The A1c test is not affected by recent food intake so patients do not need to fast to prepare for it. In addition to providing information on blood sugar control and diabetes treatment, the A1c test may also be used as an alternative test for diagnosing diabetes. Pre-Diabetes. Between 5.7% to 6.4%. A1c tests are also used to help patients with diabetes monitor how well they are keeping their blood glucose levels under control. For patients with diabetes, A1c is measured periodically up to every 2 to 3 months, or at least twice a year. While finger prick self-testing provides information on blood glucose for that moment, the A1c test shows how well blood sugar has been controlled overall for the past several months. In general, most adult patients with diabetes should aim for A1c levels below or around 7%. Your doctor may adjust this goal depending on your individual health profile. An A1c target of under 7.5% is recommended for older healthy adults. Older adults with other health problems may need higher target levels of 8.0% to 8.5%. Goal A1c levels for all children (under 18 years) are less than 7.5%. The American Diabetes Association no longer recommends various age-based A1c targets for children. The American Diabetes Association recommends that results from the A1c test be used to calculate estimated average glucose (eAG). EAG is a term that patients may see on lab results from their A1c tests. It converts the A1c percentages into the same mg/dL units that patients are familiar with from their daily home blood glucose tests. For example, an A1c of 7% suggests that the eAG is anywhere from 123 to 184 mg/dL with the most common average BG being 154 mg/dL. The eAG terminology can help patients better interpret the results of their A1c tests, and make it easier to correlate A1c with results from home blood glucose monitoring. Type 1 diabetes is characterized by the presence of a variety of antibodies that react against the islet cells. These antibodies are referred to as autoantibodies because they recognize the body's own cells, rather than a foreign invader. Blood tests for these autoantibodies can help differentiate between type 1 and type 2 diabetes. 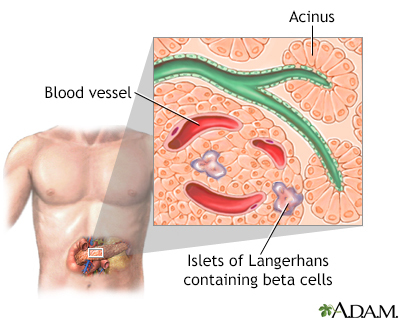 However, many patients with type 2 diabetes also have low levels of one or more autoantibodies and so autoantibodies may simply be the sign of damaged pancreatic islets beta cells. New tests for autoantibodies are being developed as research in this area continues. All patients with diabetes should be tested for high blood pressure (hypertension) and unhealthy cholesterol and lipid levels and given an electrocardiogram. 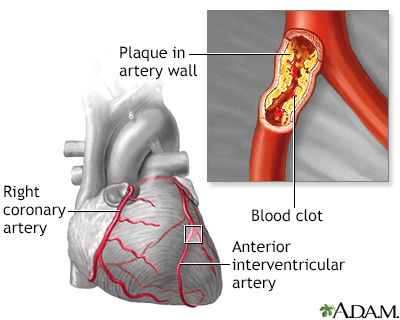 Other tests may be needed in patients with signs of heart disease. The American Diabetes Association recommends that people with diabetes receive an annual urine test for albumin. Patients should also have their blood creatinine tested at least once a year. Creatinine is a waste product that is removed from the blood by the kidneys. High levels of creatinine may indicate kidney damage. A doctor uses the results from a creatinine blood test to calculate the glomerular filtration rate (GFR). The GFR is an indicator of kidney function; it estimates how well the kidneys are cleaning the blood. The American Diabetes Association recommends that patients with type 1 diabetes have an annual comprehensive eye exam, with dilation, to check for signs of retina disease (retinopathy). Patients at low risk may need exams only every 2 to 3 years. Instead of a comprehensive eye exam, digital retinal photography may be used as a screening tool. Retinal photography uses a special type of camera to take images of the back of the eye. All patients should be screened for nerve damage (neuropathy), including an annual comprehensive foot exam. Patients who lose sensation in their feet should have a foot exam every 3 to 6 months to check for ulcers or infections. Patients should also be screened for intermittent claudication and peripheral artery disease (PAD) using the ankle-brachial index for diagnosis. Good nutrition and regular physical activity can help prevent or manage medical complications of diabetes (such as heart disease and stroke), and help patients live longer and healthier lives. Nutrition and activity in many ways are the cornerstone of blood glucose control. There is no single best diabetes diet. Patients should meet with a professional dietitian to plan an individualized diet within the general guidelines that takes into consideration their own health needs. Diabetes self-management education programs can also provide valuable nutritional advice. Weight gain is a potential side effect of intense diabetic control with insulin. Being overweight can increase the risk for health problems. The amount of weight gain caused by insulin is variable. Insulin is a growth factor and contribute to increase in weight of fat and muscle. On the other hand, studies suggest that more than one-third of women with diabetes omit or underuse insulin in order to lose weight. Eating disorders are especially dangerous in patients with diabetes and can increase the risk for diabetic ketoacidosis. Ketoacidosis is a significant complication of insulin depletion and can be life threatening. To avoid hypoglycemia, patients should inject insulin in sites away from the muscles they use the most during exercise. Insulin-dependent athletes may need to decrease insulin doses or take in more carbohydrates, especially in the form of pre-exercise snacks. Skim milk is particularly helpful. They should also drink plenty of fluids. Avoid resistance or high impact exercises. They can strain weakened blood vessels in the eyes of patients with retinopathy. High-impact exercise may also injure blood vessels in the feet. Because patients with diabetes may have silent heart disease, they should always check with their providers before undertaking vigorous exercise. Various fraudulent products are often sold on the Internet as "cures" or treatments for diabetes. These dietary supplements have not been studied or approved. The US Food and Drug Administration (FDA) and Federal Trade Commission (FTC) warn patients with diabetes not to be duped by bogus and unproven remedies. Many patients experience significant weight gain from insulin administration, which may have adverse effects on blood pressure and cholesterol levels. It is important to manage heart disease risk factors that might develop as a result of insulin treatment. A diet plan that compensates for insulin administration and supplies healthy foods is extremely important. Pancreas transplantation may eventually be considered for patients who cannot control glucose levels without frequent episodes of severe hypoglycemia. 90 to 150-180 mg/dL for most children, but an ideal goal for each individual child should be set, and may depend on history of hypoglycemia, awareness of hypoglycemia, lifestyle, and other problems. For patients with type 2 diabetes, insulin therapy may consist of one or two daily insulin injections, one daily blood sugar test, and visits to the health care team every 3 months. However, for better control of blood glucose in type 1 diabetes, intensive management is usually required. The regimen is complicated although newer insulin forms may make it easier. Basal insulin administration. The basal component of the treatment attempts to provide a steady amount of background insulin throughout the day to prevent excess production and release of glucose by the liver. Basal insulin levels maintain regular blood glucose needs. Insulin glargine offers the most consistent insulin activity level when given once a day. For some patients with type 1 diabetes glargine does not last the full 24 hours. Other intermediate and long-acting forms may be beneficial when administered twice a day. Short-acting insulin delivered continuously using a pump is another way to provide basal rates of insulin. Meal-time insulin administration. Meals require a boost (a bolus) of insulin to regulate the sudden rise in glucose levels after a meal. This insulin is designed to prevent an increase in blood sugar resulting from a meal or a snack. 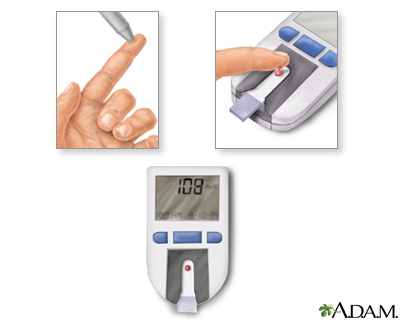 Perform four or more blood glucose tests during the day (point of care, fingerstick, using a glucose meter). This needs to be done even if you have a continuous glucose monitor. Coordinate insulin administration with calorie intake. In general, eat three meals each day at regular intervals. Snacks may be necessary, but can also mean that basal insulin rates are too high and may contribute to weight gain. Insulin requirements vary depending on many non-nutritional situations during the day, including exercise, stress, and sleep. Exercise increases the risk for low blood sugar. Some patients experience a sudden rise in blood glucose levels in the morning -- the so-called "dawn phenomenon." This usually happens if the blood sugars are too low during sleep at 3-4am which can trigger an excessive hormonal response. Because of the higher risk for hypoglycemia in children, doctors recommend that intensive insulin treatment be used very cautiously in children under 13 and not at all in very young children. Insulin lispro (Humalog), insulin glulisine (Apidra) and insulin aspart (Novo Rapid, NovoLog) lower blood sugar very quickly. Insulin peaks 30 to 60 minutes after injection and continues to have some effect for about 4 hours. The short duration reduces the risk for hypoglycemic events after eating (postprandial hypoglycemia). Optimal timing for administering this insulin is about 15 minutes before a meal. But it can also be taken immediately after a meal (within 30 minutes) for patients with nausea or gastroparesis. Regular insulin begins to act 30 minutes after injection, reaches its peak around 2 hours, and lasts about 6 to 8 hours. Regular insulin may be administered before a meal and may be better for high-fat meals. This insulin is not used as frequently for meal-time insulin. Long-acting basal insulins, such as insulin glargine (Lantus), and insulin detemir (Levemir) are released slowly. Long-acting insulin does not peak for most patients. It starts working in 2 to 4 hours and lasts as long as 24 hours (glargine) or 18 hours (detemir). New types of long-acting insulins are now available including one called degludec that last longer than 24 hours. Regimens generally include both rapid-acting and basal insulins to try to match the natural insulin secretion. Often basal insulin is injected once or twice a day (about 12 hours apart). Rapid-acting analog insulin is taken before every meal and sometimes with larger snacks. Combination of two types of insulin combined in one injection are available This can reduce the number of injections, but makes the dosing less adjustable and often make good blood glucose control difficult except for patients with very regimented daily schedules. Insulin pens, which contain cartridges of insulin, have been available for some time, although they are still more expensive than vials of insulin. These prefilled disposable pens, are more portable, do not carry the stigma of a syringe, and are easier and more convenient for patients. It is often easier for people to take meal-time insulin when they are away from home. For people with type 1 diabetes taking small amounts of insulin using insulin pens may cause less waste as pens contain only 300u of insulin while a vial contains 1000u of insulin. Afrezza, an inhaled form of fast-acting insulin. Afrezza is taken before meals and is designed for adult patients who need mealtime insulin to help control hyperglycemia in between meals. The ability to adjust dosage is limited with inhaled insulin. Afrezza is not a substitute for long-acting insulin. Patients with type 1 diabetes must use it in combination with a long-acting insulin. Afrezza should not be used by patients who smoke or those with chronic lung diseases such as asthma or COPD. The FDA will continue to examine whether Afrezza increases the risk for lung impairment or cancer, and whether it is appropriate for children. A previous inhaled insulin was withdrawn from the market because of changes in lung function and modest patient interest. Although learning to use the pump can be complicated at first, most patients find over time that the devices are fairly easy to use. Adults, adolescents, and school children use insulin pumps and even very young children (ages 2 to 7 years) are able to successfully use them. To achieve good blood sugar control, patients and parents of children must undergo some training. The patient and doctor must determine the amount of insulin used. It is not automatically calculated. This requires an initial learning period, including understanding insulin needs over the course of the day and in different situations (before exercise and driving) and knowledge of carbohydrate counting. Frequent blood testing is very important, particularly during the training period. 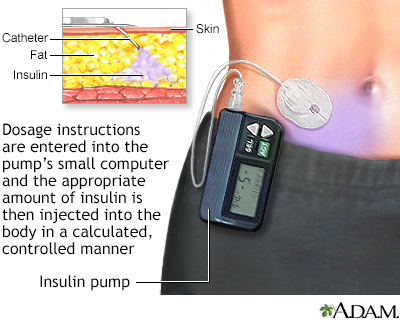 The main advantages of insulin pump use are the ability to adjust basal rates during the day, the bolus wizard which helps calculate the right dose of insulin to match a meal, not having to carry separate supplies, and the ability to combine the pump with a continuous glucose monitoring sensor that can give warnings and alerts. Despite certain challenges, research continues to progress on a "closed-loop" system that combines an insulin pump (and often a pump with a different hormone called glucagon) with a continuous glucose meter to form an artificial pancreas. Pramlintide (Symlin) is an injectable drug that is used to help control postprandial hyperglycemia, the sudden increase in blood sugar after a meal. Pramlintide is injected before meals and can help lower blood sugar levels in the 3 hours after meals. Pramlintide is used in addition to insulin for patients who take insulin regularly, but still need better blood sugar control. Pramlintide and insulin are the only two drugs approved for treatment of type 1 diabetes. Pramlintide is indicated only for adults. Pramlintide is a synthetic form of amylin, a hormone that is related to insulin. Side effects may include nausea, vomiting, abdominal pain, headache, fatigue, and dizziness. Patients with type 1 diabetes have an increased risk of severe low blood sugar (hypoglycemia) that may occur within 3 hours following a pramlintide injection. This drug should not be used if patients have trouble knowing when their blood sugar is low or have slow stomach emptying (gastroparesis). Metformin (Glucophage, generic) is an oral medication used commonly in patients with type 2 diabetes. However, some patients with type 1 diabetes may be (or become) overweight or obese and are relatively insulin-resistant. Metformin can decrease insulin needs and prevent weight gain in patients with insulin resistance. Liraglutide (Victoza) is an injectable medication used frequently in people with type 2 diabetes. This medication has also been used in people with type 1 diabetes and research studies are still evaluating the benefits of this medication in these patients. In general, people with diabetes should strive for blood pressure levels of less than 140/90 mm Hg (systolic/diastolic). For some people, especially younger patients, a systolic blood pressure goal of 130 mm Hg may be appropriate. Lowering systolic blood pressure below 130 mm Hg has not been found to provide added benefit. Lowering diastolic below 70 may cause harm. Nearly all patients who have diabetes and high blood pressure should take an ACE inhibitor (or ARB) as part of their regimen for treating their hypertension. These drugs help prevent heart and kidney damage, and are recommended as the best first-line drugs for people with diabetes and hypertension. The most common side effect of ACE inhibitors is a chronic dry cough. An angiotensin-receptor blocker (ARB) is recommended for patients who cannot tolerate ACE inhibitors. In general, adult patients should aim for LDL levels below 100 mg/dL, HDL levels over 50 mg/dL, and triglyceride levels below 150 mg/dL. The American Diabetes Association considers statin therapy for lowering LDL levels appropriate for most patients with type 1 diabetes who are 40 to 75 years old. For patients younger than age 40, statin therapy needs to be considered on an individual basis. These drugs are very effective for lowering LDL cholesterol levels. However, they may increase blood glucose levels in some patients, especially when taken in high doses. Still, statin drugs are considered generally safe. If one statin drug does not work or has side effects, the doctor may recommend switching to a different statin. The primary safety concern with statins has involved myopathy, an uncommon condition that can cause muscle damage and, in some cases, muscle and joint pain. A routine blood test for creatine kinase can monitor for this side effect. A specific myopathy called rhabdomyolysis can lead to kidney failure. People with diabetes and risk factors for myopathy should be monitored for muscle symptoms. Ezetimibe may be used in combination with a statin drug for those with recent acute coronary syndrome. A new type of medication called a PCSK9 inhibitor is now available to reduce cholesterol levels in patients with genetic causes of high cholesterol levels. This medication is given as an injection under the skin. For patients with diabetes who have additional heart disease risk factors, taking a daily aspirin can reduce the risk for blood clotting and may help protect against heart attacks. (There is not enough evidence to indicate that aspirin prevention is helpful for patients at lower risk.) These risk factors include a family history of heart disease, high blood pressure, smoking, unhealthy cholesterol levels, or excessive urine levels of the protein albumin. The recommended dose is 75 to 162 mg/day. Talk to your doctor, particularly if you are at risk for aspirin side effects such as gastrointestinal bleeding and ulcers. Patients with severe diabetic retinopathy or macular edema (swelling of the retina) should see an eye specialist who is experienced in the management and treatment of diabetic retinopathy. Once damage to the eye develops, laser or photocoagulation eye surgery may be needed. Laser surgery can help reduce vision loss in high-risk patients. Drug therapy with anti-vascular endothelial growth factor (VEGF) is also recommended for treatment of diabetic macular edema. Antibiotics are generally given. In some cases, hospitalization and intravenous antibiotics for up to 28 days may be needed for severe foot ulcers and for patients who have peripheral artery disease. Administering hyperbaric oxygen (oxygen given at high pressure) is generally reserved for patients with severe, full thickness diabetic foot ulcers that have not responded to other treatments, particularly when gangrene or an abscess is present. It is not recommended for infection in the bone (osteomyelitis). Its usefulness or benefit is not well proven or accepted. Total-contact casting (TCC) uses a cast that is designed to match the exact contour of the foot and distribute weight along the entire length of the foot. It is usually changed weekly. It may be helpful for ulcer healing and for Charcot foot. Although it is very effective in healing ulcers, recurrence is common. Anticonvulsants. Pregabalin (Lyrica) is a first-line treatment and has the strongest evidence for efficacy of all neuropathy treatments. Gabapentin (Neurontin, generic) and valproate (Depacon, generic) may also be considered. Antidepressants. Duloxetine (Cymbalta) and venlafaxine (Effexor) are recommended, as is amitriptyline (Elavil, generic). Venlafaxine may be given in combination with gabapentin. Duloxetine and venlafaxine are serotonin and norepinephrine reuptake inhibitors. Amitriptyline is a tricyclic antidepressant. Tricyclics may cause heart rhythm problems, so patients at risk need to be monitored carefully. Opioids. Opioids are powerful prescription narcotic painkillers. Dextromethorphan, morphine, oxycodone, and tramadol (Ultram, generic) may be considered for severe neuropathy pain. These drugs can cause significant side effects (nausea, constipation, and headache) and can be addictive. Neuropathy also impacts other functions, and treatments are needed to reduce their effects. If diabetes affects the nerves in the autonomic nervous system, then abnormalities of blood pressure control and bowel and bladder function may occur. Erythromycin, domperidone (Motilium), or metoclopramide (Reglan) may be used to relieve delayed stomach emptying caused by neuropathy (diabetic gastroparesis). Patients need to watch their nutrition if the problem is severe. Erectile dysfunction is also associated with neuropathy. Studies indicate that phosphodiesterase type 5 (PDE-5) drugs, such as sildenafil (Viagra), vardenafil (Levitra), tadalafil (Cialis), and avanafil (Stendra) are safe and effective, at least in the short term, for many patients with diabetes. Typical side effects are minimal but may include headache, flushing, and upper respiratory tract and flu-like symptoms. Patients who take nitrate medications for heart disease cannot use PDE-5 drugs. Recent studies have shown that testosterone replacement may also improve erectile function in older patients that have low testosterone levels in the blood. For patients with diabetes who have microalbuminuria, the American Diabetes Association strongly recommends ACE inhibitors or ARBs. Microalbuminuria is an accumulation of protein in the urine, which can signal the onset of kidney disease (nephropathy). Anemia is a common complication of end-stage kidney disease. Patients on dialysis usually need injections of erythropoiesis-stimulating drugs to increase red blood cell counts and control anemia. However, these drugs -- darbepoetin alfa (Aranesp) and epoetin alfa (Epogen and Procrit) -- can increase the risk of blood clots, stroke, heart attack, and heart failure in patients with end-stage kidney disease when they are given at higher than recommended doses. End-stage kidney disease, anemia, and treatment with medications that mimic erythropoietin change the relationship between A1c and blood glucose. In this situation, the A1c is not a reliable indicator of good glucose control. Patients with end-stage kidney disease are often at greater risk of hypoglycemia, especially fasting hypoglycemia during the night or early morning. Patients with kidney disease taking insulin to control their blood sugars often need to reduce their insulin doses as their kidney disease progresses. Other tests such as fructosamine can be used to monitor blood sugar control instead of A1c. Insulin needs increase during the pregnancy, especially during the last 3 months. Your doctor may recommend increasing your insulin dosage during this time. Both low blood sugar (hypoglycemia) and high blood sugar (hyperglycemia) are of concern for patients who take insulin. It is important, therefore, to carefully monitor blood glucose levels. In general, patients with type 1 diabetes need to take readings four or more times a day. Using fresh strips; outdated strips may not provide accurate results. Always close the bottle tightly. Avoid exposure of the strips to heat and cold. Continuous glucose monitoring systems (CGMs) use a small plastic sensor inserted under the skin of the abdomen to monitor glucose levels every 5 minutes. Depending on the system, CGMs measure glucose levels for 3 to 7 days and sound an alarm if glucose levels are too high or low. These devices are used in addition to traditional finger-stick testing and glucose meters. But these devices do not replace them. Some CGM systems are now approved for children as well as adults. The American Diabetes Association recommends continuous glucose monitoring as a useful tool for patients with type 1 diabetes. Urine tests are useful for detecting the presence of ketones. These tests should always be performed during illness or stressful situations, when diabetes is likely to go out of control. The patient should also undergo yearly urine tests for microalbuminuria (small amounts of protein in the urine), a risk factor for future kidney disease. Tests for sugar in the urine are no longer used to diagnose diabetes or monitor therapy. Monitor blood glucose levels as often as possible, generally four times or more per day. This is particularly important for patients with hypoglycemia unawareness. Patients who are at risk for hypoglycemia should always carry hard candy, juice, sugar packets, or commercially available glucose substitutes. Patients at high risk for severe hypoglycemia, and their family members, should consider having on hand a glucagon emergency kit. The kit is available by prescription and contains an injection of glucagon, a hormone that helps to quickly raise blood glucose levels in a patient who cannot eat. If the patient is helpless but able to swallow (not unconscious), family or friends should administer 3 to 5 pieces of hard candy, two to three packets of sugar, half a cup (four ounces) of fruit juice, or a commercially available glucose solution. Patients with type 1 diabetes should always wear a medical alert ID bracelet or necklace that states that they have type 1 diabetes and take insulin. Researchers continue to investigate islet-cell transplantation as a way to help patients no longer be dependent on insulin or reduce their use of insulin. This procedure has been used mostly in clinical trials. But it has helped patients with severe type 1 diabetes to become free of insulin injections. However, many of these insulin-independent patients needed to resume insulin injections within a few years. Researchers are continuing to work on refining the transplantation protocols so that benefits can be more sustainable and long lasting. A major obstacle for the islet cell transplantation is that every transplantation needs islets from two or more deceased donors to supply sufficient islet cells. Because the number of donors in many countries remains low, this procedure is only feasible for a very small percentage of patients with type 1 diabetes. Simultaneous pancreas-kidney transplant, in which the patient receives a pancreas and kidney from the same deceased donor. A fourth option, which is much less commonly performed, is for the patient to receive a partial pancreas from a living donor (typically a relative). This type of transplant may be performed at the same time as a living donor kidney transplant. Sometimes islet cells from the pancreas may be transplanted. Organ transplantation can have significant surgical and post-surgical complications. In addition, to prevent organ rejection, patients need to take immunosuppressive drugs on a lifelong basis following a transplant. Doctors generally recommend transplants in cases of end-stage kidney failure or when diabetes poses more of a threat to the patient's life than the transplant itself. American Diabetes Association. (7) Approaches to glycemic treatment. Diabetes Care. 2015;38 Suppl:S41-S48. PMID: 25537707 www.ncbi.nlm.nih.gov/pubmed/25537707. Cameron FJ, Wherrett DK. Care of diabetes in children and adolescents: controversies, changes, and consensus. Lancet. 2015;385(9982):2096-2106. Review. PMID: 26009230 www.ncbi.nlm.nih.gov/pubmed/26009230. Chiang JL, Kirkman S, Laffel LMB, Peters AL; Type 1 Diabetes Sourcebook Authors. Type 1 diabetes through the life span: a position statement of the American Diabetes Association. Diabetes Care. 2014;37(7):2034-2054. PMID: 24935775 www.ncbi.nlm.nih.gov/pubmed/24935775. de Ferranti SD, de Boer IH, Fonseca V, et al. Type 1 diabetes mellitus and cardiovascular disease: a scientific statement from the American Heart Association and American Diabetes Association. Circulation. 2014;130(13):1110-1130. Review. PMID: 25114208 www.ncbi.nlm.nih.gov/pubmed/25114208. Margolis DJ, Gupta J, Hoffstad O, et al. Lack of effectiveness of hyperbaric oxygen therapy for the treatment of diabetic foot ulcer and the prevention of amputation: a cohort study. Diabetes Care. 2013;36(7):1961-1966. PMID: 23423696 www.ncbi.nlm.nih.gov/pubmed/23423696. Nathan DM. Diabetes: advances in diagnosis and treatment. JAMA. 2015;314(10):1052-1062. Review. PMID: 26348754 www.ncbi.nlm.nih.gov/pubmed/26348754. Pillay J, Armstrong MJ, Butalia S, et al. Behavioral programs for type 1 diabetes mellitus: A systematic review and meta-analysis. Ann Intern Med. 2015;163(11):836-847. Review. PMID: 26414020 www.ncbi.nlm.nih.gov/pubmed/26414020. Reviewed By: Brent Wisse, MD, Associate Professor of Medicine, Division of Metabolism, Endocrinology & Nutrition, University of Washington School of Medicine, Seattle, WA. Also reviewed by David Zieve, MD, MHA, Isla Ogilvie, PhD, and the A.D.A.M. Editorial team. Editorial update 02-22-18.